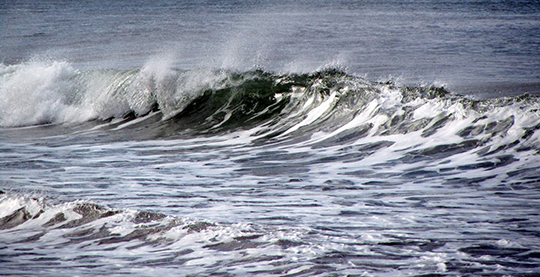 Scientists developed an approach to determine how sea spray chemistry contributes to aerosol particles in the atmosphere. Photo courtesy of co-author. Enlarge Image. Results: When tiny sea organisms called phytoplankton die, they produce oils, proteins, and other molecules that tend to stick to ocean water bubbles. Rising to the surface, these bubbles break and form sea spray. The remains of the organisms are lofted into the air where the carbon they contain can influence the chemical makeup of the atmosphere. In a new paper published in the journal Environmental Research Letters, a multi-institutional team of researchers including scientists at Pacific Northwest National Laboratory described a method to understand which types of these carbon-containing materials are prevalent in different parts of the ocean. They also determined how likely these materials are to stick to ocean bubbles that ultimately affect the chemical composition of the ocean surface and subsequent sea spray. The team included scientists at Los Alamos National Laboratory, University of Alaska, Harvard University, New Mexico Institute of Mining and Technology and University of California San Diego. Why It Matters: Covering more than 70 percent of the Earth's surface, the ocean plays a key role in regulating climate, in part because the spray from ocean waves acts as seeds for the formation of cloud droplets. Cloud droplets that form from sea spray also help shade the planet from some of the sun's rays by reflecting sunlight back to space. Understanding the chemistry that makes up these droplets and why it changes is important to knowing how the climate will react. This understanding also helps improve how natural aerosol particles like sea spray are represented in global climate models that predict how the climate will change over time. Methods: The researchers reviewed relevant literature to collect measurements of organic material chemical properties. Their reviews covered a broad range of publications, including studies in food science and other applied fields. They also gathered information about the concentrations of various types of organic compounds in different parts of the ocean. 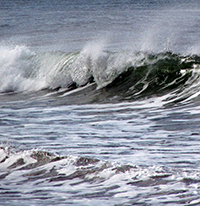 By applying basic physical chemistry concepts, they investigated how classes of organic molecules similar to those found in different parts of the ocean stick to sea spray surfaces, thus influencing their chemistry. What's Next? As a next step, scientists will simulate the composition of sea spray particles in the atmosphere and its effects on cloud properties. In addition, the research team plans to collaborate with laboratory and computational chemists to better understand how organic molecules interact with each other at the ocean surface to stick to bubbles and enter sea spray. By linking the chemical composition of aerosol particles to the output of ocean models, researchers will be able to better understand how changes in ocean biology and chemistry will affect climate in the future. Sponsors: The U.S. Department of Energy's (DOE's) Office of Science, Biological and Environmental Research funded this project via the Scientific Discovery through Advanced Computing and the Earth System Modeling Programs, with additional support from the National Science Foundation. Research Team: Scott Elliott, Los Alamos National Laboratory; Susannah Burrows and Xiaohong Liu, Pacific Northwest National Laboratory (X. Liu now at the University of Wyoming); Clara Deal, University of Alaska; Michael Long, Harvard University; Oluwaseun Ogunro and Oliver W. Wingenter, New Mexico Institute of Mining and Technology; Lynn M. Russell, University of California San Diego.